Partition attack: Any ISP can partition the Bitcoin network by hijacking few IP prefixes. Delay attack: Any ISP carrying traffic from and/or to a Bitcoin node can delay its block propagation by 20 minutes while staying completely under the radar. The potential damage to Bitcoin is worrying. Among others, these attacks could reduce miner's revenue and render the network much more susceptible to double spending. These attacks could also prevent merchants, exchanges and other large entities that hold bitcoins from performing transactions. The purpose of our research is to inform the Bitcoin users and miners as well as suggest long and short-term countermeasures. Check our paper for more details. Although one can run a Bitcoin node anywhere on earth, the nodes that compose the network today are far from being spread uniformly around the globe. Particularity, our results indicate that most of the Bitcoin nodes are hosted in few Internet Service providers (ISPs): 13 ISPs (0.026% of all ISPs) host 30% of the entire Bitcoin network (left graph). Moreover, most of the traffic exchanged between Bitcoin nodes traverse few ISPs. Indeed, our results indicate that 60% of all possible Bitcoin connections cross 3 ISPs. 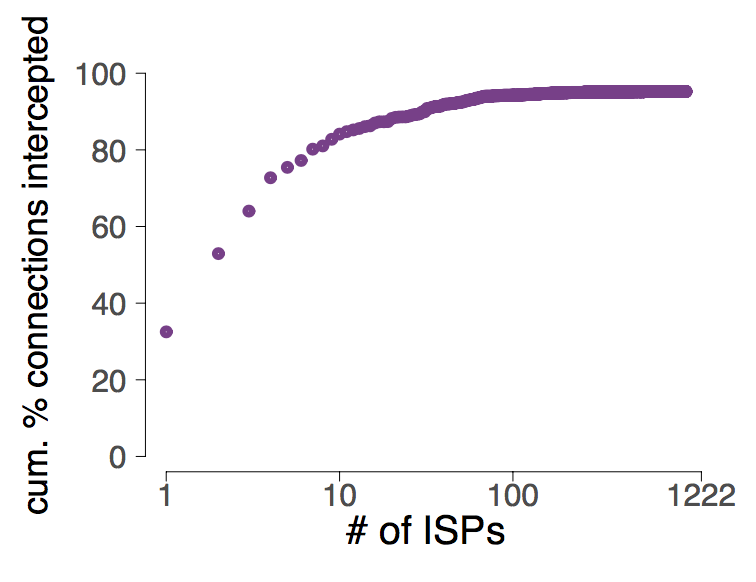 In other words, 3 ISPs can see 60% of all Bitcoin traffic (right graph). Together, these two characteristics make it relatively easy for a malicious ISP to intercept a lot of Bitcoin traffic. 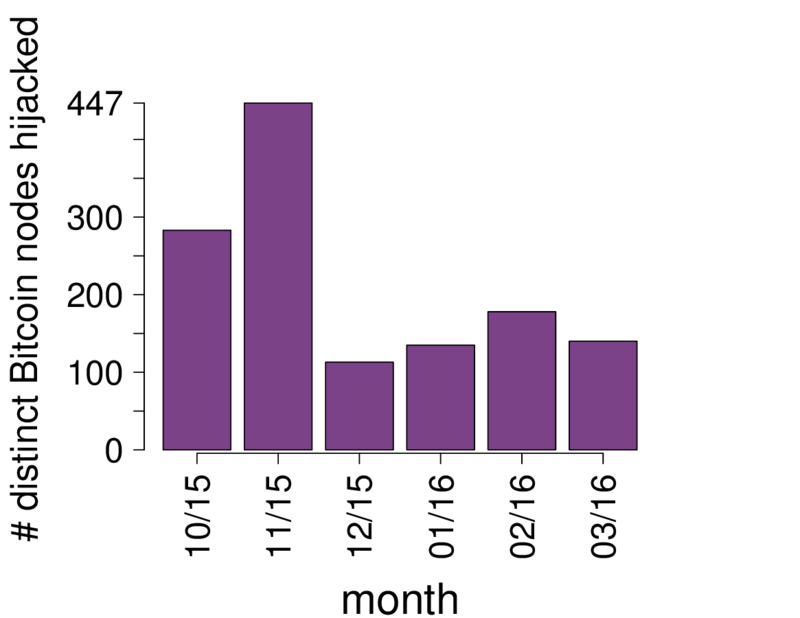 Cumulative fraction of Bitcoin nodes as a function of the number of hosting ISPs (left). 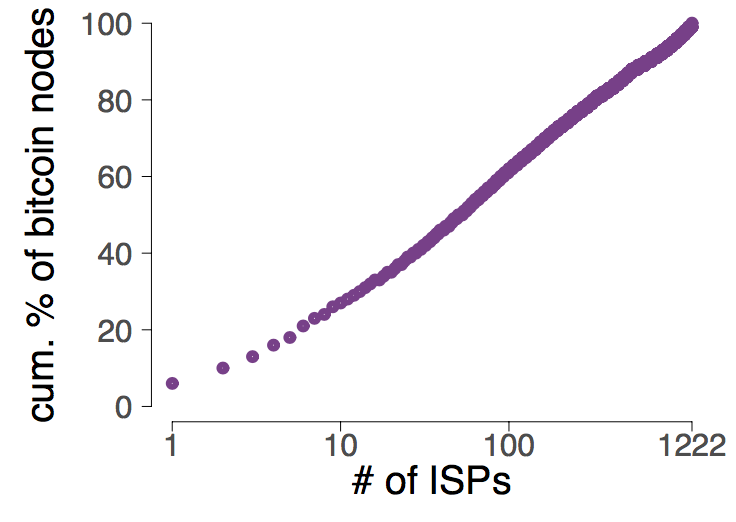 Cumulative fraction of all possible Bitcoin connections as a function of the number of ISPs that intercept them (right). Data was collected from 5 November 2015 to 15 November 2016. A BGP hijack is a routing attack in which an ISP diverts Internet traffic by advertising fake announcements in the Internet routing system. Such attacks are frequent. Actually, our results indicate that up to hundreds of thousands of hijacks happen each month. Some of those events also affect a huge number of Internet destination: up to 30,000 IP prefixes (left graph). These attacks already affect the Bitcoin network, today. Indeed, we found that, each month, at least 100 Bitcoin nodes are the victims of BGP hijacks, while 447 distinct nodes (∼8% of the Bitcoin nodes) ended up hijacked in November 2015 (right graph). Number of bitcoin clients whose traffic is diverted by BGP hijacks per month (left). 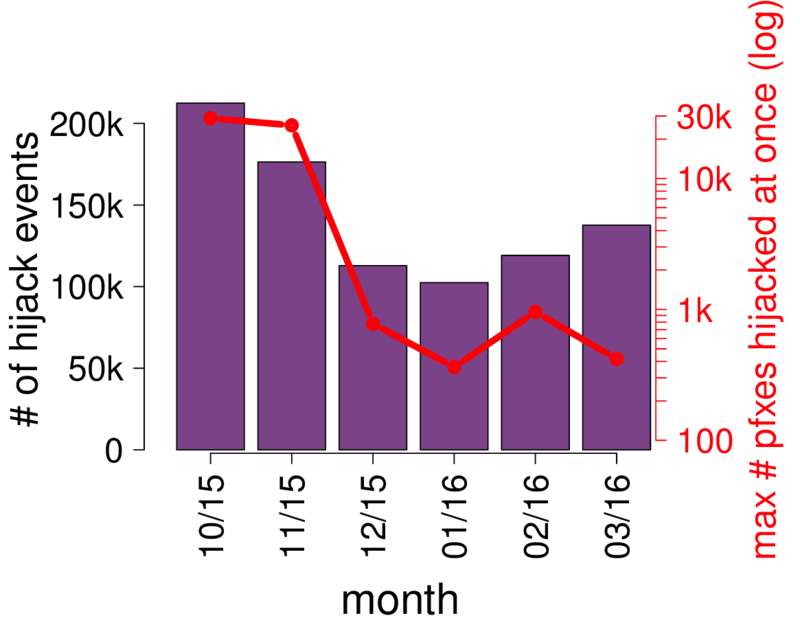 Number of hijack events per month (right). Data was collected from October 2015 to March 2016. An attacker can use routing attacks to partition the network into two (or more) disjoint components. By preventing nodes within a component to communicate with nodes outside of it, the attacker forces the creation of parallel blockchains. After the attack stops, all blocks mined within the smaller component will be discarded together with all included transactions and the miners revenue. Step 0: Nodes of the left and the right side of the network communicate via Bitcoin connections denoted by blue lines. Step 1: The attacker wishes to split the network into two disjoint components: one on the left hand-side and one on the right hand-side. Step 2: The attacker attracts the traffic destined to the left nodes by performing a BGP hijack. Step 3: Soon after the hijack, all traffic sent from the right to the left side is forwarded through the attacker (red lines). Step 4: The attacker cuts these connections, effectively partitioning the network into two pieces. Step 5: During the attack, nodes within each side continue communicating with nodes of the same side. An attacker can use routing attacks to delay the delivery of a block to a victim node by 20 minutes while staying completely undetected. During this period the victim is unaware of the most recently mined block and the corresponding transactions. The impact of this attack varies depending on the victim. If the victim is a merchant, it is susceptible to double spending attacks. If it is a miner, the attack wastes its computational power. Finally, if the victim is a regular node, it is unable to contribute to the network by propagating the last version of the blockchain. Step 0: Nodes A and B advertise the same block to the victim, node C.
Step 1: Node C requests the block via a GETDATA from node A. The attacker changes the content of the GETDATA such that it triggers the delivery of an older block from node A. Step 2: The older block is delivered. Step 3: Shortly before 20 minutes after the original block request made by node C, the attacker triggers its delivery by modifying another GETDATA message originated by C.
Step 4: The block is delivered just before the 20 minutes timeout. The victim does not disconnect from node A.
IEEE Symposium on Security and Privacy 2017. San Jose, CA , USA (May 2017). As the most successful cryptocurrency to date, Bitcoin constitutes a target of choice for attackers. While many attack vectors have already been uncovered, one important vector has been left out though: attacking the currency via the Internet routing infrastructure itself. Indeed, by manipulating routing advertisements (BGP hijacks) or by naturally intercepting traffic, Autonomous Systems (ASes) can intercept and manipulate a large fraction of Bitcoin traffic. 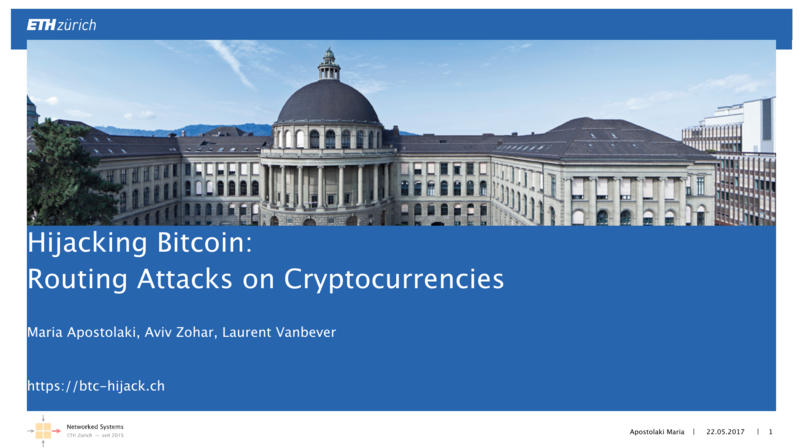 This paper presents the first taxonomy of routing attacks and their impact on Bitcoin, considering both small-scale attacks, targeting individual nodes, and large-scale attacks, targeting the network as a whole. 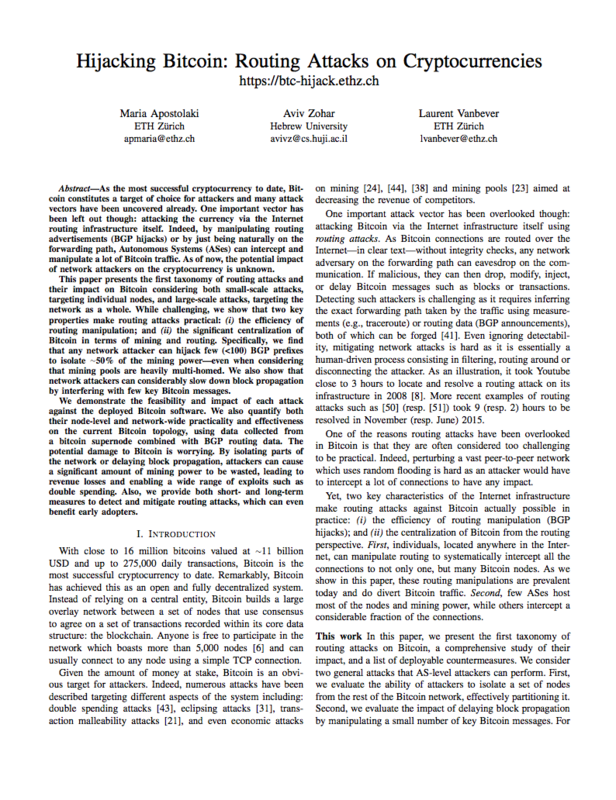 While challenging, we show that two key properties make routing attacks practical: (i) the efficiency of routing manipulation; and (ii) the significant centralization of Bitcoin in terms of mining and routing. Specifically, we find that any network attacker can hijack few (<100) BGP prefixes to isolate ∼50% of the mining power—even when considering that mining pools are heavily multi-homed. We also show that on-path network attackers can considerably slow down block propagation by interfering with few key Bitcoin messages. We demonstrate the feasibility of each attack against the deployed Bitcoin software. We also quantify their effectiveness on the current Bitcoin topology using data collected from a Bitcoin supernode combined with BGP routing data. The potential damage to Bitcoin is worrying. By isolating parts of the network or delaying block propagation, attackers can cause a significant amount of mining power to be wasted, leading to revenue losses and enabling a wide range of exploits such as double spending. To prevent such effects in practice, we provide both short and long-term countermeasures, some of which can be deployed immediately. Prototype implementation of the delay attack. Bitcoin Network Testbed of 1000 bitcoind clients.